On July 25 the journal Nature published an article about the “Economic time bomb” that is slowly being detonated by Arctic warming. Gail Whiteman of Erasmus University in the Netherlands, and Chris Hope and Peter Wadhams of the University of Cambridge suggest—based on economic modeling that the “release of methane from thawing permafrost beneath the East Siberian Sea” would come with an “average global price tag of $60 trillion.” The news should have sent a shock wave through the media. But instead, predictably, the public were encouraged to celebrate—again and again, and again—the birth of the royal son. My first encounter with methane release in the Arctic was in early August 2006. It was a grey, cold day along the Beaufort Sea coast in Alaska. Iñupiaq conservationist Robert Thompson and I were walking along the northwest corner of Barter Island when we came across a rather ghastly scene: an exposed coffin with human bones scattered around it. The permafrost (frozen soil) had melted away and exposed the coffin. Robert speculated that a grizzly bear broke open the coffin and scattered the human remains. What we didn’t see, however, is the methane that was released from thawing of the permafrost. 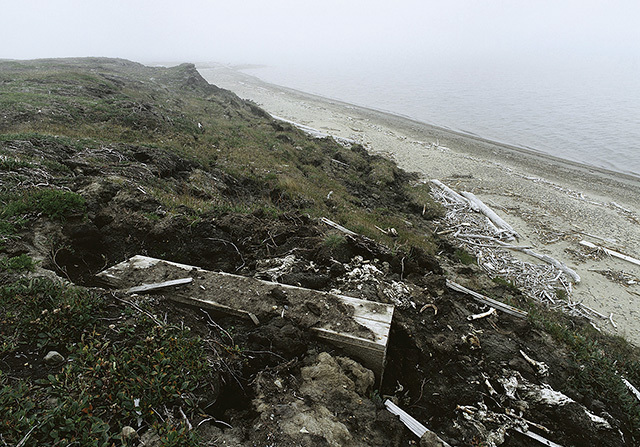 Permafrost melted away and exposed the coffin, Barter Island, Alaska. Photo by Subhankar Banerjee, August 2006. Methane (CH4) is a greenhouse gas that causes global warming and is more than twenty times more potent than CO2. 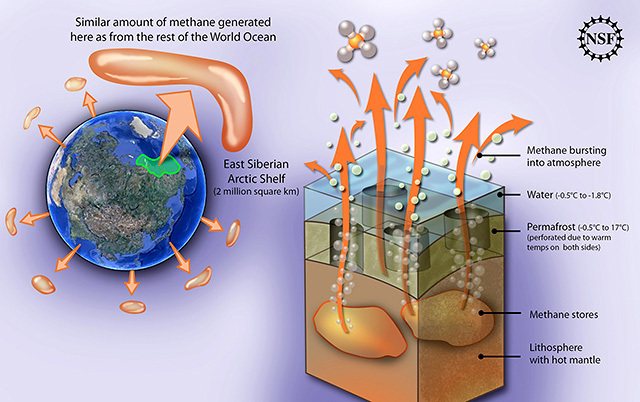 Large amount of methane is stored in the Arctic—both terrestrial and subsea. It is released in two ways: when permafrost on land thaws from warming, the soil decomposes and gradually releases methane. In the seabed, methane is stored as a methane gas or hydrate, and is released when the subsea permafrost thaws from warming. The methane release from the seabed can be larger and more abrupt than through decomposition of the terrestrial permafrost. This was alarming news because Arctic permafrost holds “30 percent or more of all the carbon stored in soils worldwide.” In reality, the Arctic sea ice is continuing to retreat at a rapid pace. The August–September sea ice extent in the Arctic Ocean had set a new record low last year: 18 per cent below the previous record of 2007. As permafrost thaws, ponds connect with the groundwater system, which lead to drying of streams, lakes and wetlands. Permafrost thawing also accelerates rates of contaminant transfer that have toxic effects on aquatic plants, fish and other animals, and also increases transfer of pollutants to marine areas. This affects not only wildlife, but also indigenous peoples who depend on fish and other animals for subsistence resources. Drunken Forest of larch trees, upper Kolyma River valley, Yakutia, Siberia, Photo by Subhankar Banerjee, November 2007. 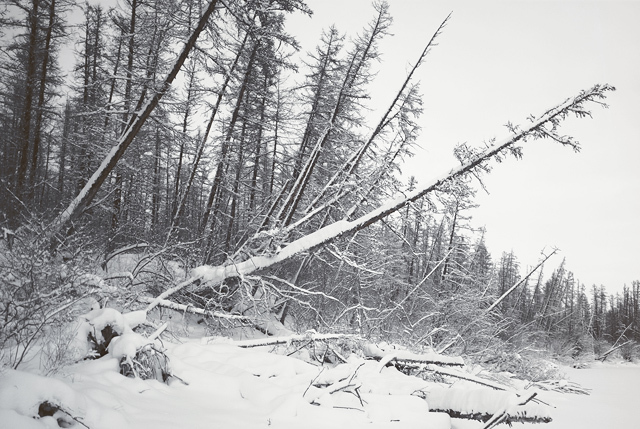 In November 2007, Robert Thompson and I had seen large areas of “drunken forests” in Eastern Siberia, not far from where Stalin’s Gulag camps were, along the Kolyma River valley. About the subsea methane release in the Arctic, I’m aware of only two studies: the decade–long and ongoing Shakhova–Semiletov climate science study in Eastern Siberia, and the Whiteman–Hope–Wadhams economic modeling that was published last week. Soon I’ll talk about both studies, but first a short journey through dystopia in a climate ravaged Earth. Is it possible that climate change experts in the US are keeping their feelings private and not speaking out with outrage against Obama’s petro–imperial and pro–coal energy policy—for the fear of—…? On July 22 the Yale Environment 360 published an article in which nine climate change experts, including Michael Mann, Bill McKibben and Carol Browner gave their comments on “Obama’s New Climate Plan.” Eight contributors provided a more or less supportive view of the plan. The ninth contributor, however, a policy analyst from the Heritage Foundation, unsurprisingly took the discussion in the opposite direction, “President Obama’s climate plan would have a chilling effect on the economy.” For a more critical analysis of the Obama climate plan, you can see Chris Willams’ article here and mine here. Broadly speaking the comments on Yale Environment 360 focused on emission reduction from coal–fired power plants and natural gas as a good “bridge fuel.” No one mentioned a word about the “climate time bomb” that Obama had set off with his “National Strategy for the Arctic Region” in May. And no one said anything about the grave eco–cultural and climate consequences of—his support for expansion of fossil fuels extraction—across the American land and the oceans. Shell’s drilling in the Beaufort and Chukchi Seas in Arctic Alaska (in 2011 I wrote that permits were rubber–stamped, and despite repeated appeals, the Obama administration refused to do an Environmental Impact Statement (EIS)—a blatant violation of the National Environmental Policy Act). Massive expansion of gas fracking—onshore that Tara Lohan of AlterNet has been writing about all summer, and also offshore off of the coast of California that we learned last week from a Truthout investigative report (no EIS was done for the California offshore fracking project either). Hyper–deepwater drilling in the Gulf of Mexico (earlier this year Shell announced plan to drill the deepest offshore oil well in the Gulf of Mexico—almost two miles below the water surface, which is twice the depth of BP’s Deepwater Horizon well that caused the worst oil spill in US history). Expansion of coal mining in the Powder River Basin of Wyoming. My intention here is not to start a debate about which is the worst offender, but to point out that all of these mega extraction projects will cause massive eco–cultural devastations and contribute enormously to global climate change. After both their drill rigs, Noble Discoverer and Kulluk, suffered heavy damages and were cited for EPA violations, Shell abandoned the 2013 drilling plan in Alaska’s Arctic seas. I wrote in a letter to the editors in the June 6 issue of The New York Review of Books, “There will be calm in the Arctic Ocean this summer.” I was wrong. As it turns out, right now, instead of drilling, Shell is doing sonar surveys in the Chukchi Sea, using the Finnish icebreaker Fennica, to inspect “ice gouges” on the seafloor where Shell “might build pipelines to offshore oil wells,” as reported by Alaska KTUU–TV on July 23. With air guns and sonar equipments that Shell is using, the Chukchi Sea is certainly not calm this summer. Why are the climate change experts focusing only on emission reduction, and not on extraction reduction also, you might ask? It might seem paradoxical that while the US is trying to reduce emissions, it is also increasing extractions at the same time. I have a theory. A significant part of the extracted fossil fuels would be sent to other places around the world (like coal from the Powder River Basin will go to Asia)—to make huge money. It will get burned somewhere and contribute to the global climate change. Emissions statistics, however, would show that America is reducing emission and is solving the climate crisis—at home. It’ll all look good on paper. Not so fast though. Two years ago Joseph Nevins pointed out on Truthout, “The US military is the world’s single biggest consumer of fossil fuels, and the single entity most responsible for destabilizing the Earth’s climate.” Now imagine: If the American military burns oil in a mission to Afghanistan, that was extracted from America’s Arctic Ocean, would that be included in the accounting of American emission? I think not. If my theory of—emission vs. extraction—proves true, it’d be yet another example of American exceptionalism. You would think it would be logical to scrap the mega extraction projects if we are sincere about solving the climate crisis. It would indeed be, if we were living in a decent society. But instead, we’re living in a dystopian one. There are four elements of dystopia: ecological, political, sociological, and economic—as it relates to climate change. Scientists from around the world have been using various climate models over the past three decades to predict the ecological future. At times, what’s happening in the real world is proving to be more frightening than the outcome of the climate models. For example, the Arctic sea ice is melting at a rate faster than what the models had predicted few years ago. Polar bear mothers and cubs are dying from exhaustion having to swim longer distances in open water of the Arctic Ocean; lack of summer sea ice is forcing thousands of Pacific walruses onshore where they are getting crammed on narrow barrier islands, stampeding and crushing smaller calves; reptiles and rodents are getting burned alive underground by extreme wildfires in New Mexico; nearly 55 million piñon trees died during the last decade from bark beetles infestation in New Mexico; 19 firefighters were killed by a raging wildfire last month in Arizona—are just a few examples of our current climate ravaged America. The future for the whole Earth looks much worse. This is what I’d call—ecological dystopia. The ecological dystopia, however, didn’t paralyze activists to fight for a better future. I was at the 2009 UN Climate Summit COP15 in Copenhagen. The official summit was a dismal failure. The unofficial Klimaforum, however, gave renewed energy to the climate justice movement. By fighting the political system, we had envisioned, it might be possible to move away from fossil fuels, and toward a clean energy future. However, less than four years later, it has now become clear that fossil fuels extraction is rapidly increasing with government support in North America. It will continue to be that way through the rest of this century, and perhaps beyond. And globally—Russia, China, India, Brazil—the story is the same. This is what I’d call—political dystopia. We’re already saying adios to one American coastal city: “Goodbye, Miami.” Jeff Goodell wrote in Rolling Stone recently that Miami, and much of South Florida would be underwater by the end of the century due to rising sea level. The primary reason behind the sea level rise is the melting of the Greenland ice cap. Soon we will start saying adios to an inland American city also: “Goodbye, Phoenix.” Drought, heat, fires, water shortage—will make much of the American southwest uninhabitable. People would be faced with two choices. Those who can afford would move away to more habitable places (from Phoenix to Portland, or from St. Pete to Seattle, for example). But for most people, particularly poor people won’t have a choice to move—to a better place. The latter condition would be called, “displacement without moving” that Rob Nixon coined in his groundbreaking book, Slow Violence and the Environmentalism of the Poor (Harvard). Additionally, the American police state might use brutal techniques against millions of people who would become climate refugees, and would be forced to migrate. If you don’t believe me read a bit further. Mexico (like southern Arizona, New Mexico and Texas) would be hit hard by climate change. It is likely that tens of millions of Mexicans would be forced to move North—to the US and Canada—just to survive. The US government is perhaps envisioning such a future scenario. I’d suggest that this is perhaps one of the reasons why America is spending tens of billions of dollars on—not only building a 700–mile long “Mexico–United States barrier,” but also turning the border into a “War Zone,” as Todd Miller recently pointed out on TomDispatch. Globally the situation would be similar, as a South–North migration forced by climate change is inevitable. In the Arctic, communities are already being forced to move from their ancestral lands. Here are a few recent books on the subject of migration and displacement forced by climate change: Climate Change and Migration (Oxford), Climate Change and Displacement (Hart), Migration and Climate Change (Cambridge), Climate Change and Displacement Reader (Routledge), and Kivalina: A Climate Change Story (Haymarket). The tremendous social chaos that will arise from migration and “displacement without moving” is what I’d call—sociological dystopia. The Whiteman–Hope–Wadhams study has brought to sharp focus, the fourth element—economic dystopia. During the 1990s Russian scientist Dr. Natalia Shakhova had done studies of methane release from terrestrial permafrost in Eastern Siberia. In the fall of 2003, Shakhova and her colleague Dr. Igor Semiletov took the study offshore—to the East Siberian Arctic Shelf. Every year since then, they conducted annual research trips, mostly on ships during summer, but also one aerial survey in 2006, and one winter expedition on sea ice in April 2007. They published their findings in the 5 March 2010 issue of the journal Science. Methane release from the East Siberian Arctic Shelf. Credit: Zina Deretsky, National Science Foundation. Shakhova and Semiletov now hold joint appointments with the International Arctic Research Center at the University of Alaska Fairbanks and the Pacific Oceanological Institute of the Russian Academy of Sciences. Their research is ongoing, and Shakhova is the lead scientist for the Russia–US Methane Study. I pointed out earlier that the rapid loss of summer sea ice in the Arctic Ocean is a key contributor to—thawing of terrestrial permafrost. It is also a key contributor to—thawing of the subsea permafrost in the East Siberian Arctic Shelf. With all these background information, I’m finally ready to discuss the Whiteman–Hope–Wadhams study. Arctic nations, including US, Russia, Canada, Norway, Denmark, as well as some non–Arctic nations, including China and India—are eyeing on the Arctic Economic Prize: “oil and gas” underneath the Arctic seabed. It is estimated that the Arctic Ocean contains 13 percent of undiscovered oil and 30 percent of undiscovered gas. These nations are also working to open up the Arctic sea route for moving all that crude around. It’s a great irony that the rapid melting of the summer sea ice is making the Arctic Ocean accessible for extraction and shipping. Whiteman, Hope, and Wadhams point out that this frenzy for short–term profit is ignoring the long–term huge “economic impacts of a warming Arctic.” By using modeling they tried to understand the global economic impact of methane release from the East Siberian Arctic Shelf. Referring to the Shakhova–Semiletov study, Whiteman, Hope, and Wadhams write: “A 50–gigatonne (Gt) reservoir of methane, stored in the form of hydrates, exists on the East Siberian Arctic Shelf. It is likely to be emitted as the seabed warms, either steadily over 50 years or suddenly.” They use “a decade–long pulse of 50 Gt of methane, released into the atmosphere between 2015 and 2025” as input to the PAGE09 economic model. They took into account “sea–level changes, economic and non–economic sectors and discontinuities such as the melting of the Greenland and West Antarctic ice sheets.” They ran the model 10,000 times under two emissions scenarios: low–emissions and business–as–usual emissions. The result is a shocker: a $60 trillion price tag for the global economy. “The economic consequences will be distributed around the globe, but the modeling shows that about 80 percent of them will occur in the poorer economies of Africa, Asia and South America,” Whiteman, Hope, and Wadhams write. The $60 trillion number is astounding, beyond the comprehension of most human minds. It has the capacity to cripple the economy of many small nations, that are already stressed from global economic crises. This is what I’d call—economic dystopia. They also point out that oil and gas drilling in the Arctic Ocean will make warming worse, as gas flaring emits “black carbon, which absorbs solar radiation and speeds up ice melt.” Is Shell listening to any of this? Certainly not! Is Obama listening to any of this? Certainly not! Like Shakhova and Semiletov, my engagement with the Arctic is also ongoing. Over the past fourteen years I met so many wonderful people all across the world who are working on various Arctic issues. I danced to Gwich’in fiddle music in Arctic Village, and to Iñupiat drumming in Kaktovik. There, I learned that singing and dancing are not just for celebration, but also to heal from past wounds, and to fight for a more just future—for “the diversity of life” on Earth. But what should we do to move away from the state of dystopia that we find ourselves in, you might ask? No one has the answer, but many are offering ideas, are engaged in conversations, taking various actions. Update: The article uses methane’s Global Warming Potential (GWP) over a 100–year horizon, which according to the IPCC is 25 times more than carbon dioxide. But the 20–year horizon GWP for methane is 72 according to the IPCC 4th assessment report. This means methane is 72 times more potent as a greenhouse gas than carbon dioxide over a 20–year period. And according to Drew Shindell and his group at NASA, taking into account aerosol responses, the numbers are even higher, 105 for 20–year and 33 for 100–year. We ought to be using the 20–year value because the short to mid–term is far more important than the 100–year horizon (it’s hard to even imagine what Earth would look like 100 years from now). Subhankar Banerjee is a photographer, writer, and activist. 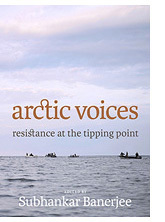 His most recent book Arctic Voices: Resistance at the Tipping Point will be published in paperback on August 20 (Seven Stories Press). He was recently Director’s Visitor at the Institute for Advanced Study in Princeton, Distinguished Visiting Professor at Fordham University in New York, received Distinguished Alumnus Award from the New Mexico State University, and Cultural Freedom Award from Lannan Foundation.